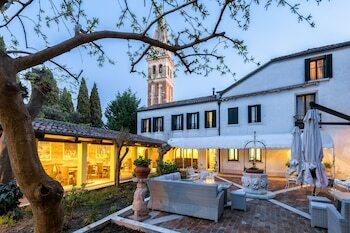 Located in Venice, Relais Alberti is by the sea, within a 10-minute drive of Circolo Golf Venezia Alberoni and Venice Convention Center. Featured amenities include complimentary wired Internet access, express check-in, and dry cleaning/laundry services. A ferry terminal shuttle is provided at no charge. A stay at La Casa del Maestro places you in the heart of Pragelato, steps from Susa Valley and Via Lattea Ski Area. Free self parking is available onsite. When you stay at Green House in Loreto, you'll be next to a golf course and 7 minutes by car from Basilica di Loreto. Free self parking is available onsite. Located in Rome (Vatican), Bed&Breakfast Il Tesoro is within a 15-minute walk of St. Peter's Basilica and Vatican Museums. Featured amenities include a 24-hour front desk and an elevator (lift). With a stay at Dunant Guest House in Rome (Gianicolense), you'll be within a 15-minute drive of Colosseum and St. Peter's Basilica. The front desk is staffed during limited hours.